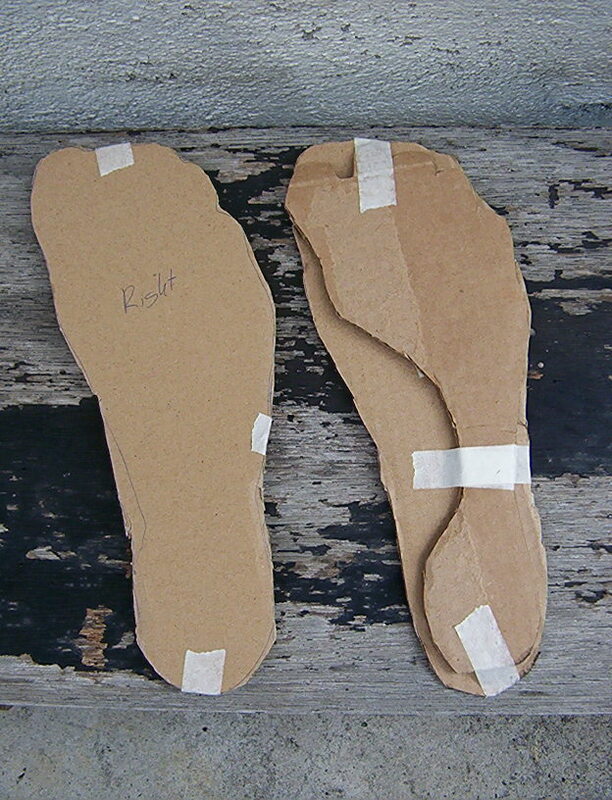 I'm thinking of building a home-made minimalist "barefoot" shoe. I used to walk barefoot nearly all the time, even in semi-urban environments such as Traverse City and Waikiki. However, lately I've moved into a slightly seedier neighborhood with more gravel and asphalt and where any open grass is generally used as a dog run. I no longer have a good barefoot running route either. Thus, I have since gotten out of barefooting practice. It may also be that I've gotten older. I'm more aware of social stigma against going barefoot in public as well as the potential germs of barefooting in an urban environment. Still, I'd like to get back into barefoot practice, especially for nature hikes. 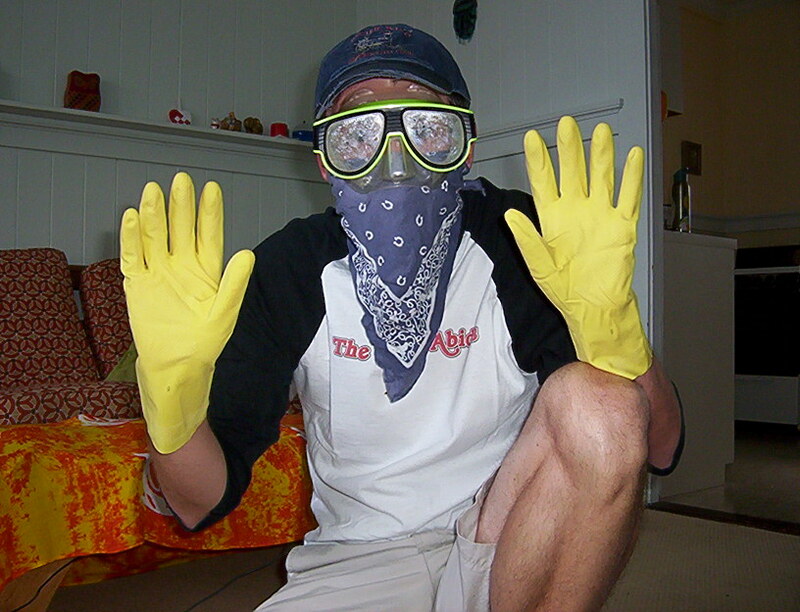 But that means I'll need some protection for an urban environment. I'd also like to find a cheap yet comfortable pair of shoes that let my feet breath in the tropics and yet don't rub or give me blisters. Sole is very thin--the thinner, the better! Shoe is comfortable: breathes in the tropics and doesn't rub/blister. 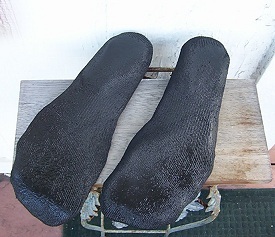 Sole is non-slip, such as on wet bathroom tile floors. Shoe is tight on the foot; not saggy. Shoe is subtle: not too obviously noticeable or weird to causal observers. Shoe is easy to manufacture at home. Shoe is easy to clean and maintain; should not stink. Soleless footware can make it look like you're wearing shoes. But I need an actual sole. Most moccasins are too thick. I had a minimalist pair of mocs once, with very thin leather soles. But they were rather saggy on my feet. Also, the leather would soak up water on rainy days. To avoid "sagginess", complicated straps and potentially too-thick soles, I've been thinking of using a sock as a base for the shoe. The name "soccasin" immediately sprang to mind. This name is already used to referred to a crocheted indoor slipper. 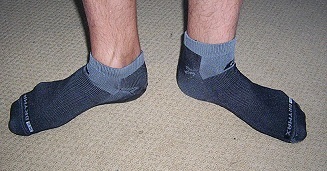 There are also other kinds of non-slip or gripper socks (such as with little nubs or non-slip designs on the sole), but these are all meant for indoor use only. There are some good sock-based designs for babies and toddlers out there, such as Skidders, Bical Grippers, and Nowalis. 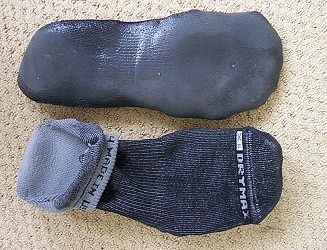 This is pretty close to what I currently have in mind--though a homemade sole will likely be thinner with smaller nubs. These slipper socks are closer to what I envisioned--though I must admit these look pretty dorky. The Sock Mocs and Acorn astronaut slipper socks are better, though a bit too heavy duty for my purposes. Living in Hawaii, I suppose a pair of good flip-flops (called slippers here) would be a good solution too--except for the fairly thick sole. 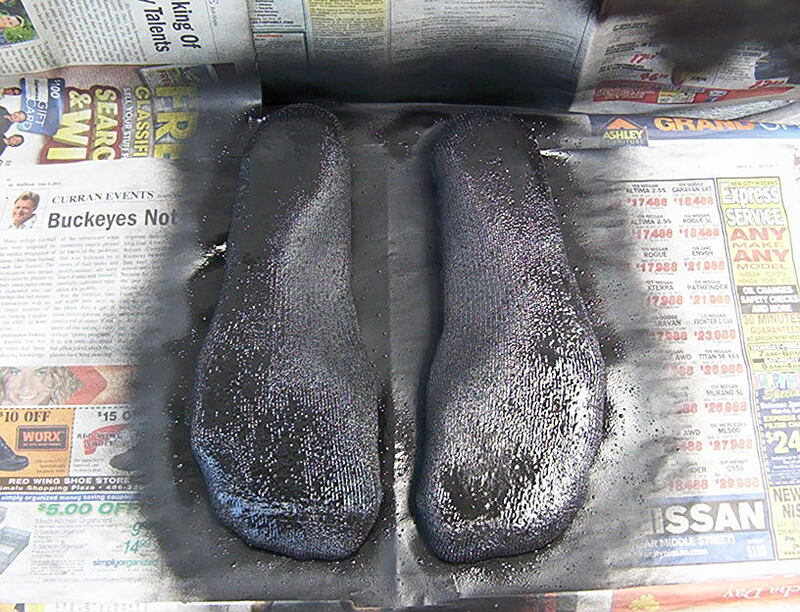 So I am imagining a cool-looking short sock with a thin waterproof non-slip sole. The sole should probably come up about half an inch all the way around the foot. For the sole, I considered various materials that would have to be attached somehow: rubber dish-washing gloves, neoprene, shower curtain, Four-Square ball, etc. Most of these are likely too flimsy, and then there's the issue of how to stitch or (probably better) glue it to the sock. 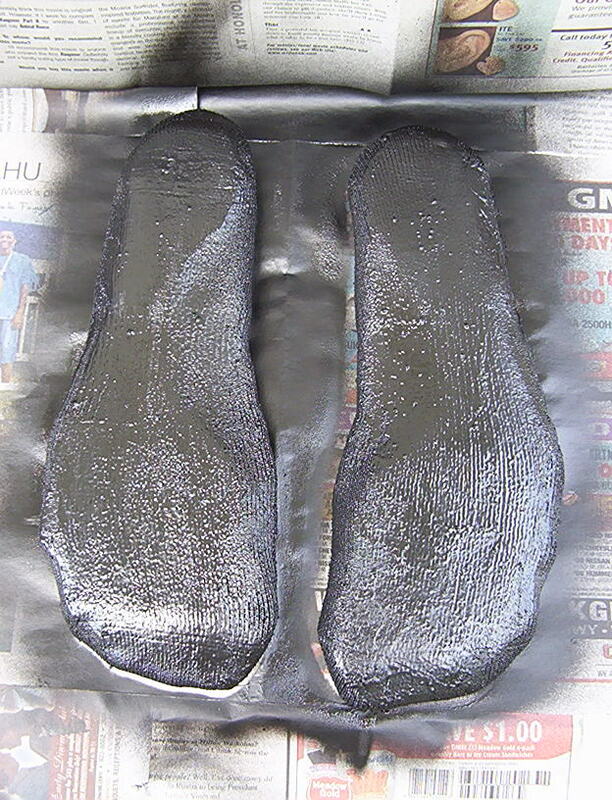 Of these, I think goop would be best; but Plasti-Dip would easier to use and is about 1/5 the price. 07 Jun 2011: Now that I know the keywords that describe what I want to do, I'm starting to stumble upon people that have already tried it! It's always disappointing to find you're not the first person to think of something! But, on the bright side, it sounds like it works fine. Advice is that the the plasti-dip shrinks a bit as it dries. I currently have a bunch of accumulated gift card money at Amazon.com. 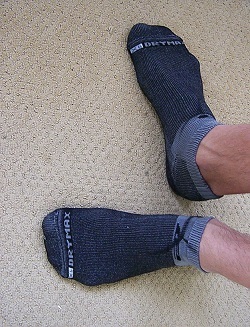 So I ordered a 3-pack of dark grey/black Drymax Trail socks ($27), mostly because they looked good; but the extreme wicking feature should be helpful too here in the tropics. I also ordered a spray can of black Plasti-Dip ($7, but $25 with shipping!). I was ordering a bunch of things and didn't realize that 3/4 of my shipping bill came from this one item, or I would have reconsidered! Oh well. 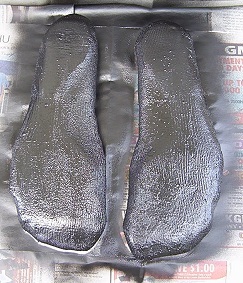 I didn't want to apply the Plasti-Dip directly to my feet with a spray can. 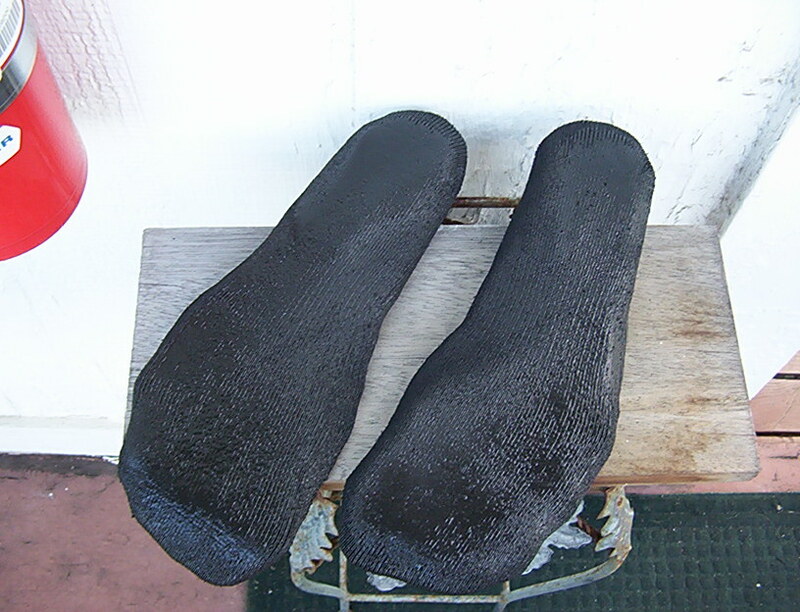 That would be hard to do neatly and might not be safe if the wet rubber soaked through the socks. But I also wanted to make sure the socks still had the right shape when I was done. So I made some cardboard cutouts to fill out the socks. 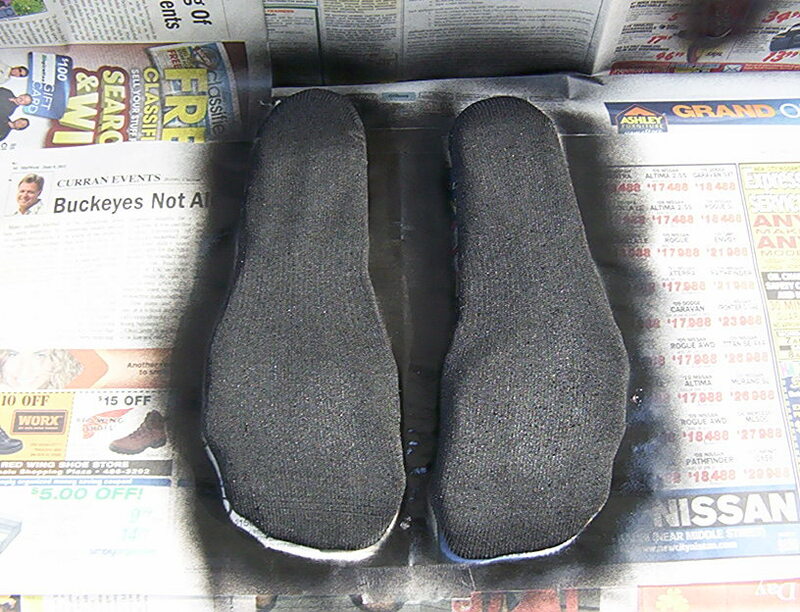 As a double-check, I put the socks on my feet and draw a line with a permanent marker around the side of my foot where I wanted the Plasti-Dip to go. When I then put the cardboard cutout inserts into the socks, they lined up fairly well with the line. ... and myself. After reading the back of the can (contains known carcinogens), I didn't really want to accidently get any of this stuff in my eyes or on my skin. I believe it is the propellants and solvents that are hazardous and that the dried rubber is not a health risk. 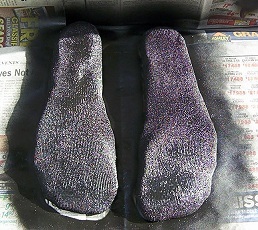 I did a light first coat so as not to soak into the sock very much. This stuff goes on like spray paint. About 25 minutes later, I applied a heavier second coat. 10 minutes later the weather was starting to turn rainy again. So I held the spray can closer to the surface and got a thicker distribution. I focused just on the footprint areas this time. Then I set the socks aside for the night in a dry spot outside. This is how things looked as they started to dry. The ribs of the socks are still obvious. 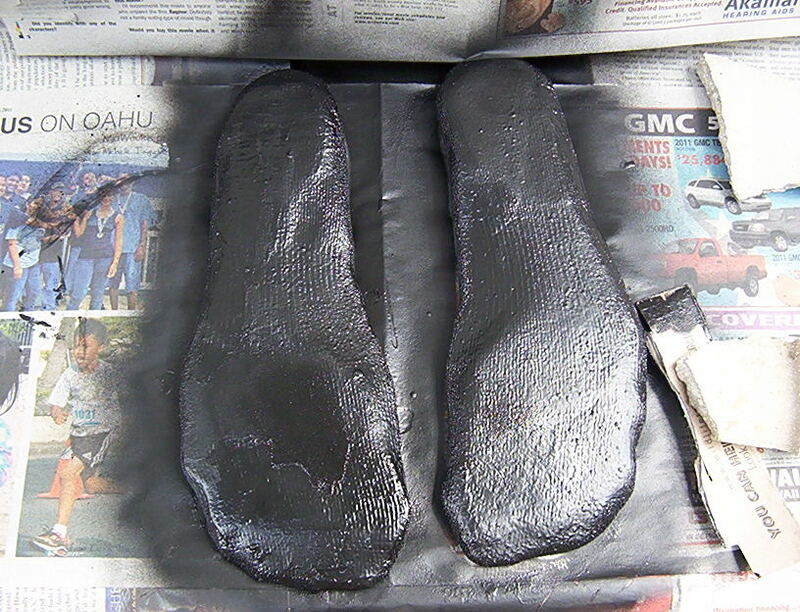 I had envisioned a nice smooth covering over the entire sole. I almost have that here in a couple places, though. 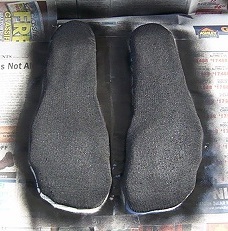 The sides are hard to cover with the spray can, though, as shown on the heel and at the toe. I'm not sure why this should be; it seems like you should just be able to point and spray. 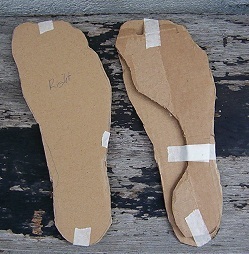 A couple hours later, after grocery shopping, I used the cardboard technique again to try to patch up the heel edges. Then I did a thin even spray coat over everything. After letting the socks dry for a couple days, here's how they look. Initial impressions are that they're decent but not great. 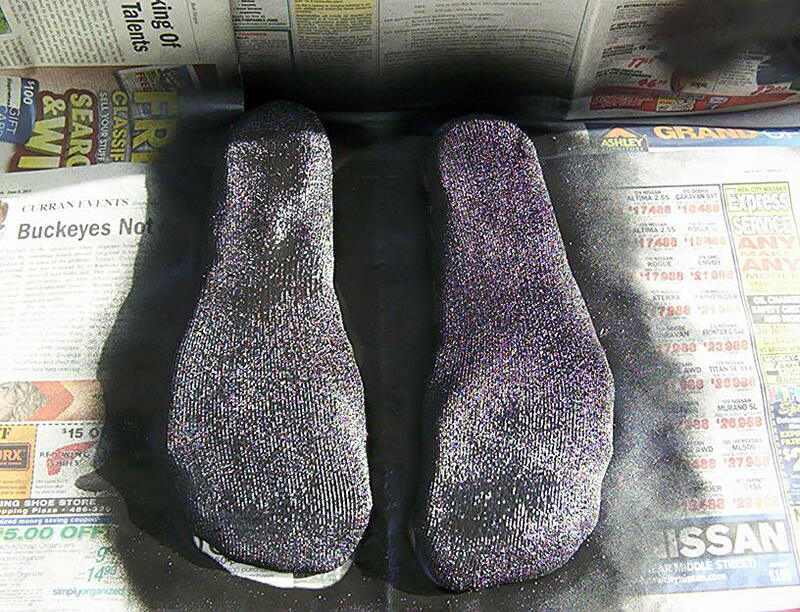 First of all, I accidentally got some overspray on the upper part of the sock. This may have been due to working in a breezy area. Next time, I'll be sure to cover everything I don't want rubberized. The bottoms are quite "grippy". They pick up lint from the carpet and make a slightly sticky sound when walking in the kitchen. 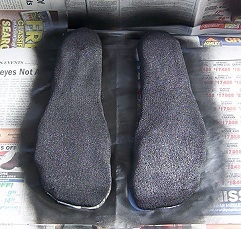 I didn't get a chance to spray any Plasti-Dip on the upper portion yet, particularly on the toe. (I only have about 1/4 can left.) So they just look like socks when worn. I then took the socks out for a spin--about a 2 mile walk on concrete and asphalt. These socks were already fairly thick, but the soles felt good. They were thin enough to feel different textures, like manhole-cover designs, gravel, grass, etc. And stepping on a stone with the heel of my foot still hurt, just like barefooting! Of course, it's not the rich experience real barefooting is; it's like feeling things with a pair of gloves on. On the bright side, it was a very hot day. I could feel the ground temperature differences between hot crosswalks and cold sidewalks in front of open shop doors. Some of those crosswalks were probably too hot to actually barefoot on, so these plasti-socks are a nice option. I also didn't notice too many people looking at my feet, so they're not too obviously weird. However, they weren't perfect. As I walked, the socks would gradually work their way down my feet, getting too much slack in the toes. I think this might be because the soles grip well, and so the rolling action of my foot gradually works my foot back towards the heel. The heel is not strong enough to compensate. 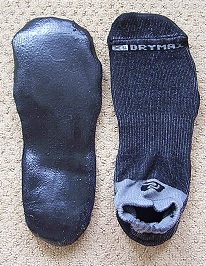 One idea to fix this is to spray a thick heel cap around the back of the sock to give the sock a more solid structure. 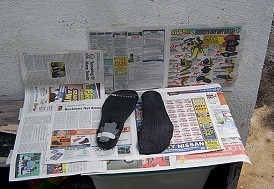 Another is to try to add some no-slip surface to the inside of the sock. Or I could sew on some sort of heel strap. 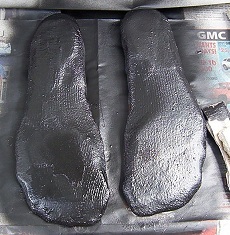 Here's how the sole looked after my walk. They held up fairly well, though the sole is a little rough looking under the ball of my foot. I'll have to see how that wears in future. 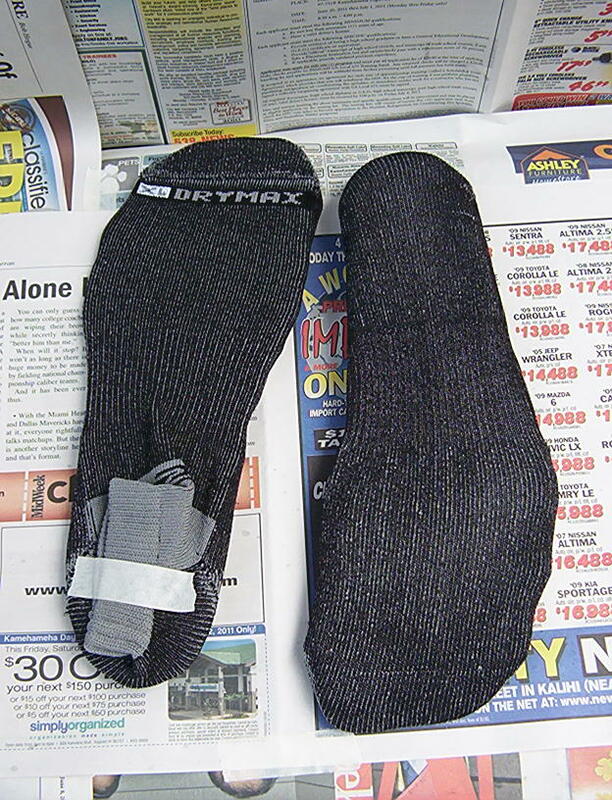 As you can see, the inside of the sock is still nice and soft; no rubber soaked through from the rubberizing process. My woman suggested I call these "smockasins", as a portmanteau of sock, mock, and moccasin. Today I took my smockasin for another spin. They did fairly well. There's something fun about walking out of the house in socks. It makes you feel casual, as if you're as comfortable anywhere in the world as in your own living room. It also makes you feel a little vulnerable, but in a good way. You have to walk humbly and tread lightly on the face of the earth. I also find I'm more conscious of my posture and stand up straighter. As with barefooting, there's a drawback to not having an elevating sole: the cuffs of my jeans dragged on the ground. 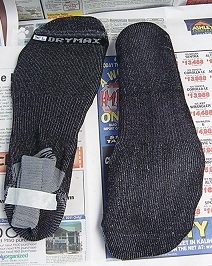 With wear and road dirt, the socks aren't so sticky-sounding on tile, which is good. They continue to slip down towards the toe, though. This was particularly noticable on rough concrete, where the tip of my sock toe seemed to catch. The one on the left (my right foot) is a rubber-soled smockasin. 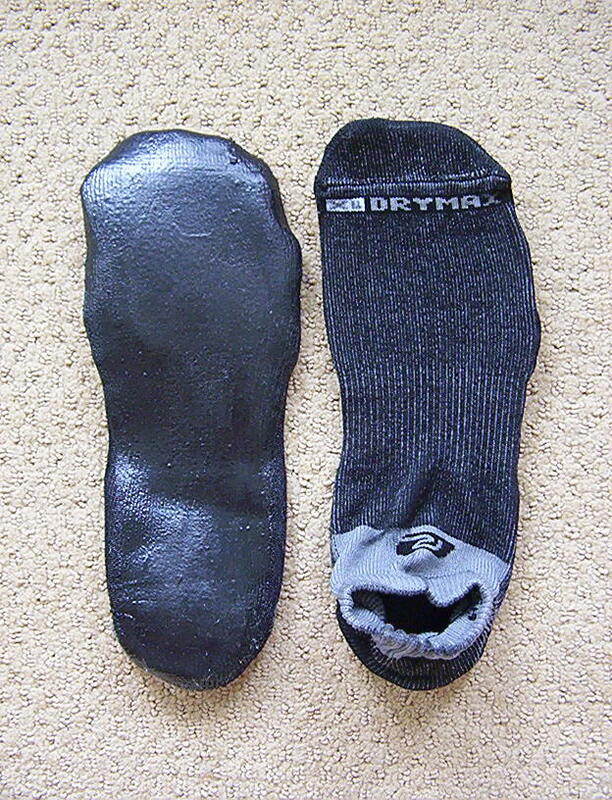 The one on the right (my left foot) is an original Drymax sock. They are both pulled on as high/tight as they will naturally go. My conclusion here is that my cardboard inserts were not sufficient to compensate for the shrinkage due to the drying Plasti-Dip. I lost about 1 inch of sock length and 1/2 inch of sock width. I think this is why the socks don't stay on as well anymore: the back of the sock no longer comes up high enough to get my heel into the proper heel cup area. I'm not sure what do to fix this in this prototype pair. I think on the next pair, I'll try using some clips to pull the socks tighter around the inserts so that there is more stretchy slack in the non-rubberized upper half. This would also fix my other complaint, which is that the rubber doesn't come high enough around the sides and toe. This makes it look like I'm wearing normal socks. Also, it doesn't provide any sock protection from shallow puddles and wet grass. I also tried a bathtub test today to simulate wet tile. 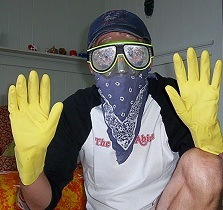 These smockasins are less slippery than bare feet in the tub. However, there was some slight dampness in the sock afterwards. I'm pretty sure the rubber is water-proof, so they probably just got wet around the low rim and soaked through.